The first time I made a Swiss Roll I do believe it was in my Home Economics class and I was around 14 years old. That was over 30 years ago. It was also the last time I made a Swiss Roll. In case you haven’t picked up on this yet, Swiss Roll making isn’t a high frequency activity in my kitchen. Anyhoo…I needed to make something for my Thursday lunch group. It needed to be something simple and non energy-sapping. 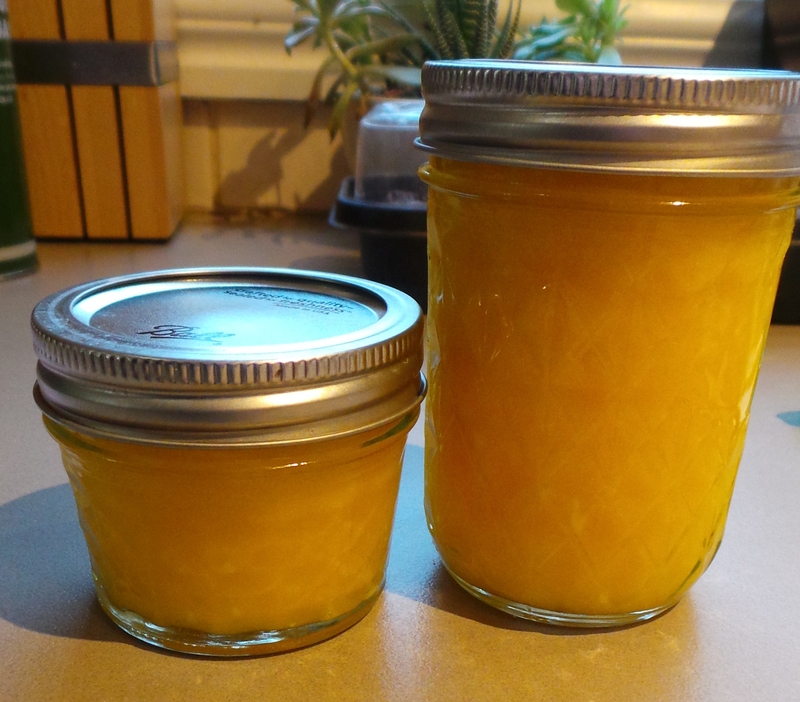 I’d just made a double batch of Lemon Butter and thought maybe some of that could be used in … something? 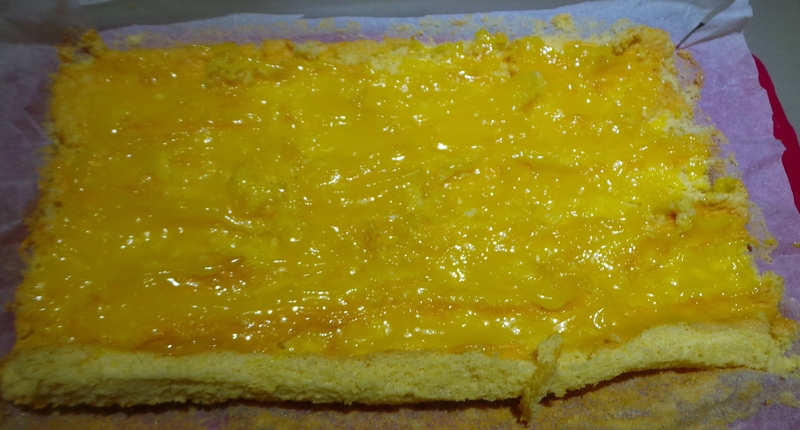 Then I remembered that one of the ladies at the group is doing a cookery course and one of her assignments was a sponge cake filled with lemon curd. ‘What about a Swiss Roll?’ something whispered in the back of my head. I found this very simple recipe here on one of Jamie Oliver’s sites. I can honestly say it’s one of the easiest things I have ever made. The hardest part was working out whether I had a Swiss Roll tin! I knew they were big and flattish but…so I asked Mr Google and found the answer resided here, with the ever delectable Nigella Lawson. A Swiss roll tin is a specific tin that is designed to bake a thin, rectangular sponge cake that is then rolled up to make a Swiss roll (jelly roll or roulade). It has slightly raised edges (about 2 to 3cm/3/4 to 1 inch) deep and has dimensions of roughly 23 x 33cm (9 x 13 inches). I had one of those. It was all good. I also had all three (3!) of the necessary ingredients. I used a stand mixer because I can’t hold things very well right now and I could just turn this on and block my ears. If you have a hand-held electric beater or whisk then go for it. If you have none of these things but are possessed of a balloon whisk and well-developed biceps, then feel free to join in the fun. Heat your oven to 200°C/400°F. 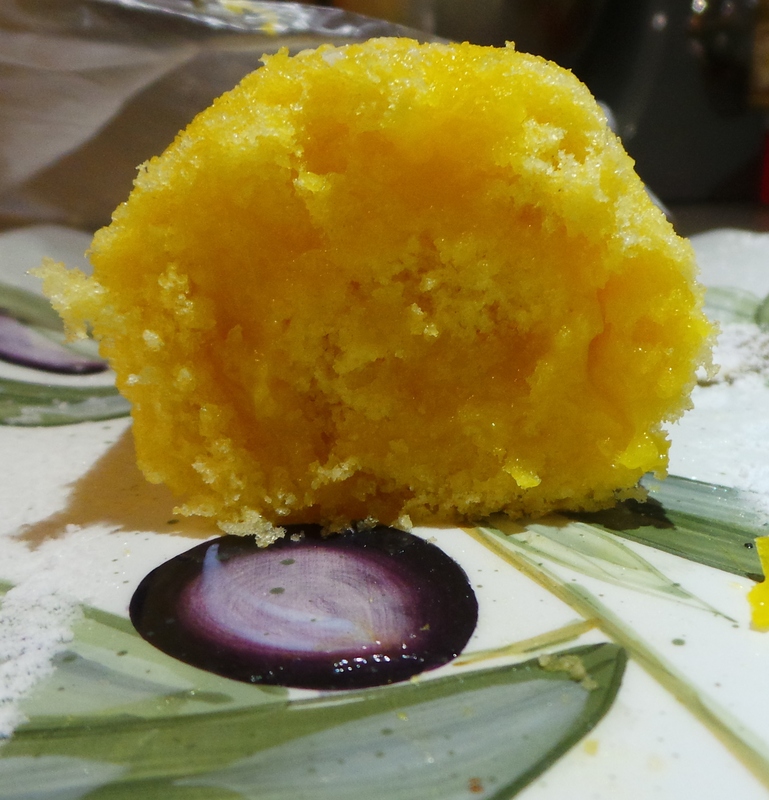 Start with sifting a teeny amount of caster sugar into a bowl and add three eggs. Start with eggs and sugar. Now beat. 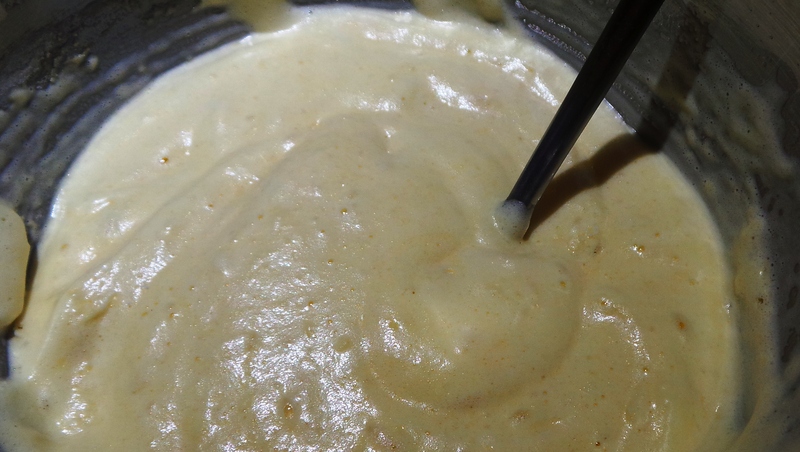 Whisk the two together until the mixture becomes thick and creamy. This could take quite some time. I stopped at one point and decided to add some lemon zest to the batter just to tie it to the lemon butter a bit better. Not sure it made a measurable contribution in the end. You can see it’s getting a little thicker here. Can you see the ripples? That. Put your electric beaters away; from this point on being gentle is your game plan. Sift the Self Raising flour into a bowl and then sift it again into the mixture. 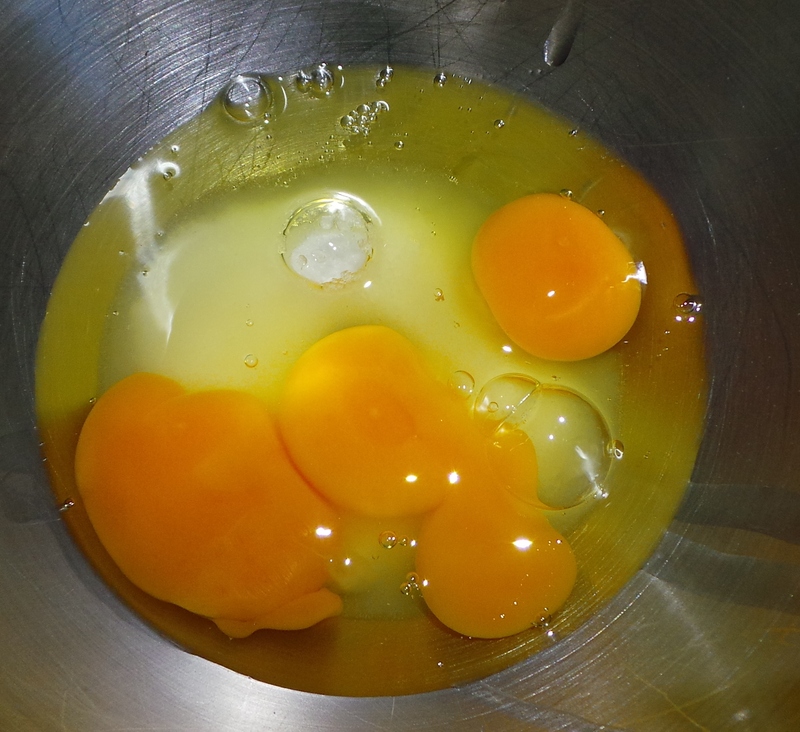 Fold it through the egg mixture using a metal fork. I might be the only person you know who uses a fork for this, but it works. Folding is basically the same as stirring, but in slow motion. You are trying not to beat out all the air that you have just beat into the egg mixture. Think of the flour as just being there to stabilise that structure. Once all the flour is incorporated, stop. Line your Swiss roll tin. Pour the mixture into the tin and spread out with a spatula. Again, be gentle. Trim the paper after you’ve filled the tin. Bake for 7-8 minutes, until lightly brown and fully set. Now, this here is the secret bit so listen up! I remembered this from Home Ec. all those years ago. Mrs Wood would be proud. You’ve got to roll it up while it’s still warm and let it cool that way. That prevents cracks (and tears ) caused by rolling up a cold cake. So, using the paper lining, pull the cake up out of the tin and onto a cake rack. Decide if you want to roll from the long side or the short and orient your cake accordingly. Mine was to serve a lot of people after a lot of food – small slices would do. I went for the long side roll. 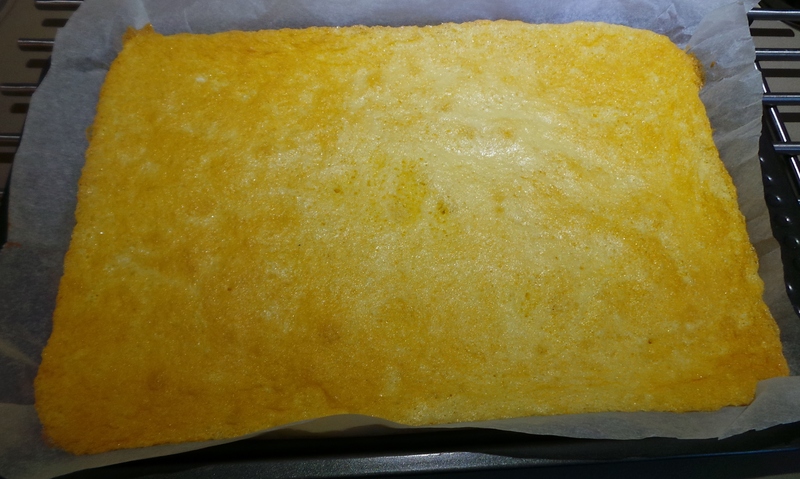 Pull the paper away from the other edges, so it doesn’t get rolled into the cake. Roll up slowly with the lining paper still on. This will stop it from sticking to itself when you need to unroll it later. 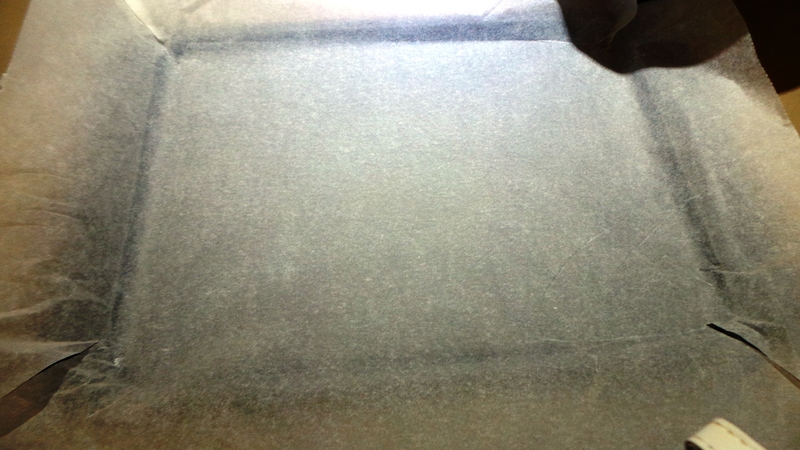 Then roll your roll up in a clean, dry tea towel. Leave it until it is completely cool. Roll into a tea towel. Alternatively, you might wish to remove the backing paper and use a tea towel in its place so that the fabric is holding the cake apart. I didn’t have any tea towels without a pile to hand and that would have only ended badly. When it is completely cool, unroll and fill with lemon butter if you wish. You might also like to use jam, or thickly whipped cream. Just remember that you need to roll it up again, so don’t slather it on or you’ll have filling oozing out everywhere. Spread with your filling of choice. Re roll, this time leaving the paper (or tea towel) behind. I wrapped mine up, sausage-like, in cling wrap and refrigerated it overnight. 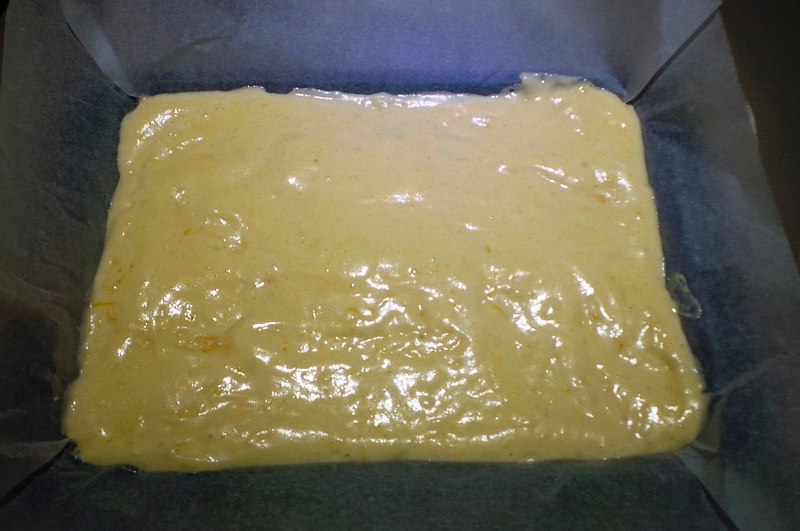 To serve, place on a serving tray and sprinkle with icing (confectioner’s) sugar – I forgot to take a picture of this bit. Sorry. Sift the flour onto a plate. 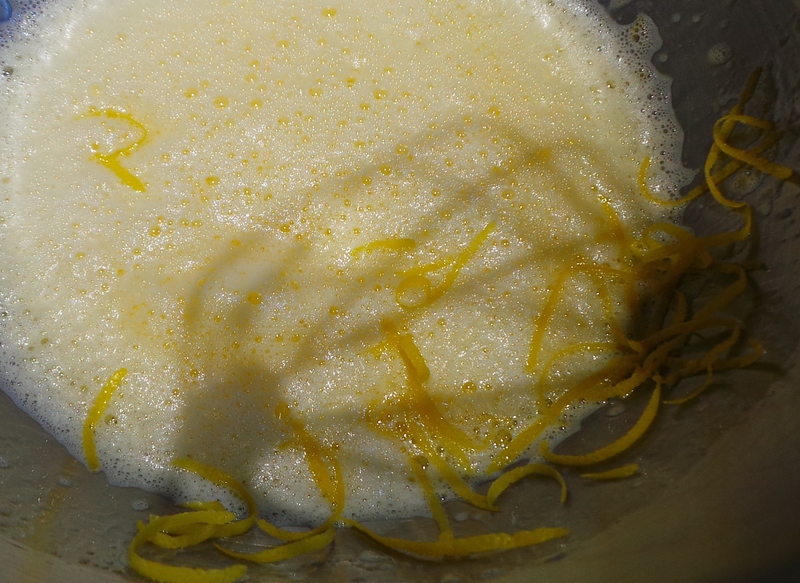 Place the eggs and sift sugar into a mixing bowl. 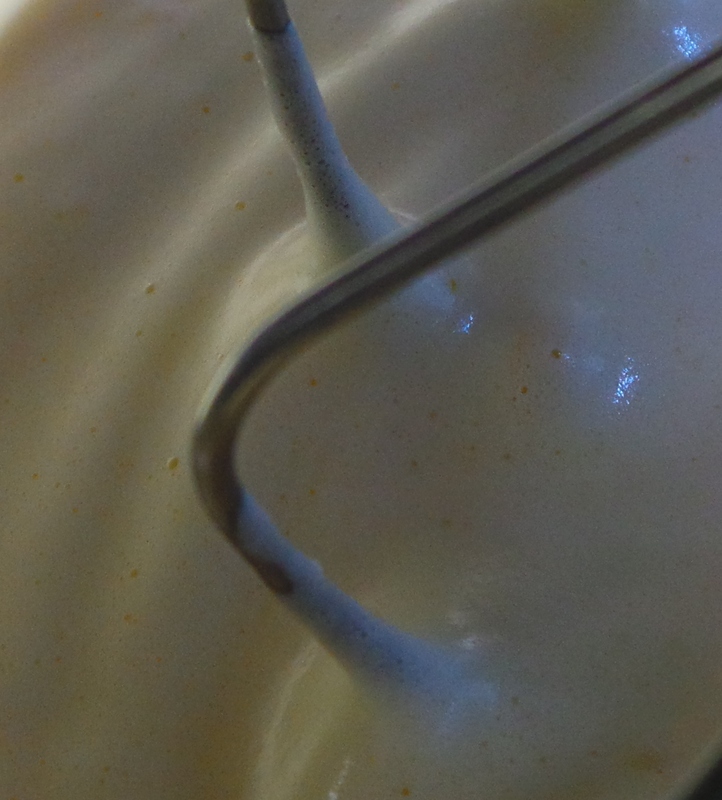 Whisk using an electric beater until the mixture becomes thick and creamy and the beaters leave a visible trail. About 5 minutes. Sift the flour (for a second time) into the mixing bowl and gently fold into the mixture using a fork. Pour the mixture into the prepared tin and spread out gently with a spatula. 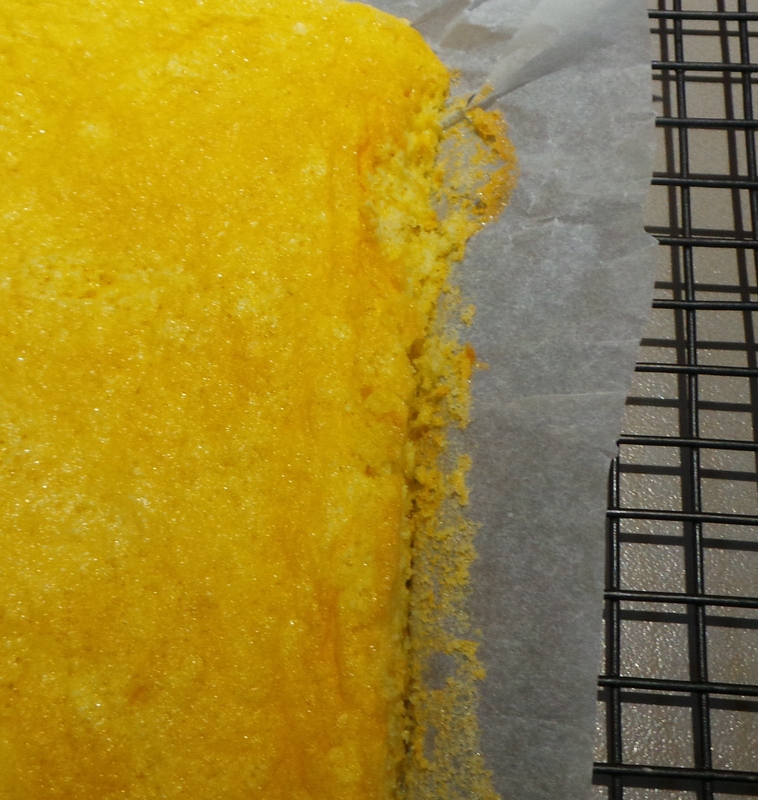 Turn out of the tin onto a cooling rack and gently remove the backing paper. Roll up using a clean, woven tea-towel and leave until cool. When cool, unroll and spread with your desired filling. Re-roll. Place on serving dish with the edge of the roll on the bottom, and sprinkle with icing or confectioner’s sugar.